If you're in a foreign country, travelling from A to B by yourself is no easy task. Sure, all those jumbled letters could be directing you towards taxis or a nearby hotel, but you can never really be too sure. And if you happen to be in a country with a different alphabet altogether, well, you're reliant on the hope of someone speaking your language. It's a situation we've all found ourselves in, and why translation hearables from the likes of Pilot and Bragi have gained prominence in the tech community, with travellers hoping to forego the stress of finding their way, reading menus or taking in the sights and instead interacting with locals through a smart earbud. Another competitor in the field, MyManu, successfully completed its campaign on Kickstarter back in September 2016, with the Manchester, UK based startup also recently gaining recognition by becoming a winner of Marriott's TestBED accelerator programme. Its live translation hearable, the MyManu Clik, will now be trialled for 10 weeks in the chain's hotel Madrid hotel. "When I first heard that we won, I was obviously really happy. It's something that we've been trying to explore because, while we have engineers that test everything we do, you don't really get the opportunity to give the device to normal people in an environment and let them try it out," Danny Manu, founder of MyManu, told us. "It's expensive for a startup like us to go into a hotel and get them on board, so it's nice to get a trial period with Marriott and hopefully there's some feedback we can get which will help us add more value to the product." Before it began its route into Marriott hotels, though, MyManu was busy raising close to £100,000 on Kickstarter. The Clik earbud, which provides live translation through its cloud-based system, allows users to communicate simultaneously with different people from across the world in 37 languages. A full transcript of the conversation is also available through the companion app, while wearers can access music, receive a read-out of app and text notifications from a simple swipe, touch or press action and even charge their smartphone using the Clik's charging case. But while it's proven to be a success on two fronts, there have been issues with the rollout to backers of the project. "Initially, we planned to start shipping in May," Manu said. "But when we were in our testing stage we realised there were still some things that needed to be done. For example, we wanted to change the Clik case and make sure that it could charge a smartphone. 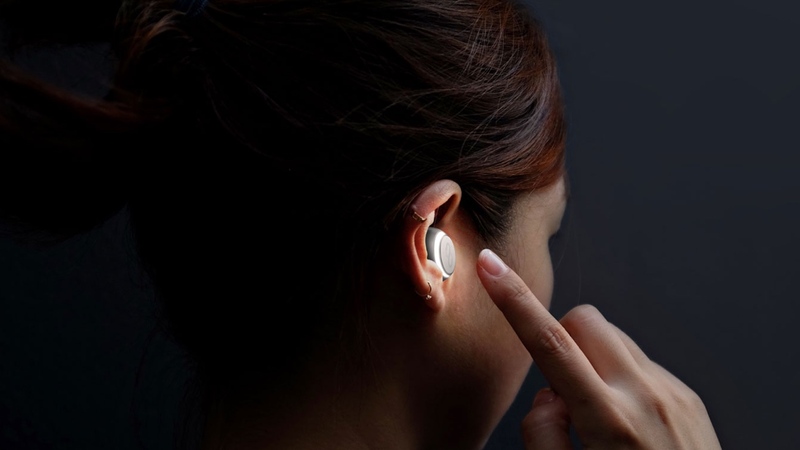 "And there's also some things with connectivity that needed further testing — unlike other earbuds that use Bluetooth, Clik uses an Near Field Magnetic Induction (NFMI) connectivity, whereby you're not going to lose any audio signal, and it was also the only earbud with a 120mAh battery. "We pushed the date back, and this allowed us to actually interact with the community more and make further changes. And at the end of the day we didn't want to ship a product that wasn't 100% ready. As a startup, we have very low resources, so it's impossible for us to ship a product and then launch a recall if something isn't working." Despite its delays in production, Manu indicated that the Clik is now scheduled to begin the first batch of shipments on 23 October, with the rest of the Kickstarter units flooding in before the turn of the year ahead of more a wide-scale launch in 2018. As we've touched upon, Clik isn't the only translation hearable operating in the space and looking to make traveller's lives easier. However, Manu is eager for people to understand that his company was the first to dip into the space. "One thing I always say to people who mention Waverly Labs' Pilot is, "Have you tried a prototype of it?". And most of the time they haven't. We were the people that actually started translation earbuds — you can find that out from YouTube videos demonstrating concepts. "And Clik, unlike some others you might see, isn't just about putting something in your ear and translating, there's also sound quality there like no other true wireless earbud in the market — we have a two-way BA driver for hi-fi audio, and we'll be the first to implement that." Like its rivals, Clik's system will look to recognise the sentence or word before it begins, so there's currently no real indication with regard to latency. But, as Manu pointed out, the company has lots of plans in the pipeline in order to separate itself from rivals. Not only will it use the Marriott TestBED programme to refine its hearable after it being in the ears of users, but the team is also working on implementing the likes of machine learning and standalone connectivity to future models in order to make the experience of travelling in a different country truly stress free. And before the turn of the year, Manu also noted that more software innovations should be hitting the Clik. We'll be testing a pair of Clik smart earbuds out ourselves very soon so look out for a review on the site. If it can build upon the promise of its crowdfunding success through its involvement with Marriott and keep pushing rivals into the next phase of translation earbuds, this won't be the last you hear of MyManu. And, who knows, you might just wish you had a pair the next time Google Maps fails you on holiday. Totally lost confidence in that company. I did place a pre-order in jan 2018, was supposed to be delivered in April 2018. So far (feb 2019), still nothing received, despite the emails I sent them, and for which I've never received a clear and valuable answer. Last but not least ! Got an email this morning (very rare from myManu...) saying they should be able to ship in May 2019 ! I'll now try to get refund.